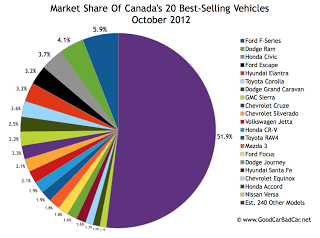 Canadians registered 135,696 new vehicles in October 2012, according to the ANDC, a near-10K-unit improvement over October 2011. 5.9% of those new vehicles were Ford F-Series pickups, that’s up from the F-Series’ 5.5% market share at this time last year. By itself, the F-Series outsold the Volkswagen Group, Dodge, Kia, Nissan and Infiniti, Mazda, and many other high-volume brands. But to an extent, that’s old news. The F-Series is a strong seller every month. The F-Series is joined by four other Fords on October’s list of the 30 best-selling vehicles in Canada. There are also four Chrysler Group vehicles, from the second-ranked Ram to the 28th-ranked Jeep Wrangler. Honda landed two cars and one crossover in the top 30, including the suddenly surging Honda Accord. There are six Hyundais and Kias, including the two Hyundai crossovers which have struggled most of this year to match last year’s pace. Four Toyotas, including the second-best-selling subcompact, the Yaris, up 86.5% in October, finished anywhere from sixth to 30th. General Motors positioned itself with the eighth, ninth, and tenth-best-selling vehicles, plus the 18th-ranked Chevrolet Equinox. This leaves the Mazda 3, Nissan Versa, and two Volkswagens. Not to sound like a broken record, but historic brand and corporate totals (monthly and yearly going back to 2004) are now available through the dropdown menu at GCBC’s Sales Stats page, along with results for more than 260 currently sold vehicles. That’s where you’ll find out that Volkswagen last broke the 2000-unit barrier with the Golf in March 2010, when only 870 Jettas were sold. Jetta sales have only dipped below the 1000-unit mark twice, and have jumped over the 2000-unit mark 18 times, in the 31 months since then. 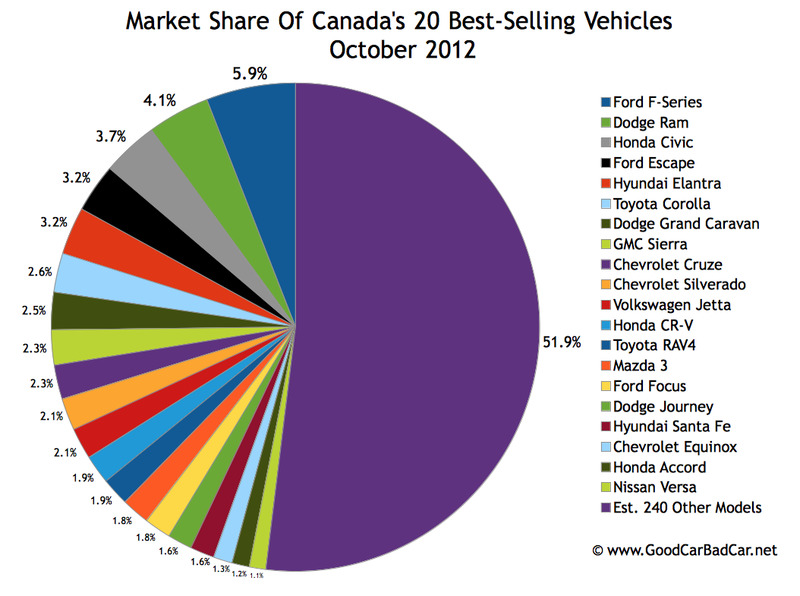 Below you’ll find Canada’s 30 best-selling vehicles from October 2012. Automobiles of all types are represented. Best Sellers were also broken down into cars, trucks, and SUVs yesterday. Links to those stories are clickable at the bottom of this post.